A group research project to improve biking experience on Carnegie Mellon's campus for the many student and staff cyclists . As a health-conscious, sustainable campus, Carnegie Mellon's student, faculty, and staff population depend heavily on biking as their medium of transportation. However, the bike parking situation is not optimized for the large cycling population. Many complain that their bikes get damaged or inconveniently parked. As a group-based user research project, my team, Grace Wong, Lucy Yu, and I designed a potential solution, Biker's Nest. Biker's Nest is an idea proposal for conceptual bike shelters around the campus that implement protection from weather, adequate space, and convenient locations for cyclists access. Our initial brainstorming identifying a real problem and proof, as well as details on why the problem exists. We defined our problemspace: unprotected, unorganized bikes on campus, based on observation of preexisting issues. Next step was to define why the solution would be significant to our audience: on campus bikers, and the scope of people who will be affected by our intervention. We developed a stakeholder and territory map to figure out the scope of our project to identify the people we need to reach out and what we are trying to accomplish. To conduct our research, we made a set of survey and map for CMU cyclists to rate their duration and satisfaction in parking. The second part of the survey asked respondents to record their usual bike routes on the campus map. Based on this, we created a heat map of routes most frequently taken by CMU cyclists. Our goals were to find the average time of the day the bikes are parked at school and what factors contribute to making a bike parking spot desirable or not. Also, we wanted to find the best possible places for the bike racks to be located by identifying which routes on average are used most often. Communicating with bikers and receiving their feedback in actual context helped us realize our initial hypothesis on bike theft was not really as serious of a problem as to the cluster and lack of space on the bike racks. Based on the findings, we reshaped our proposal to concentrate on maximizing space, installing bike racks with better organization, and protecting bikes from the weather over improving security. In addition, we also decided to increase the bike racks in convenient locations. 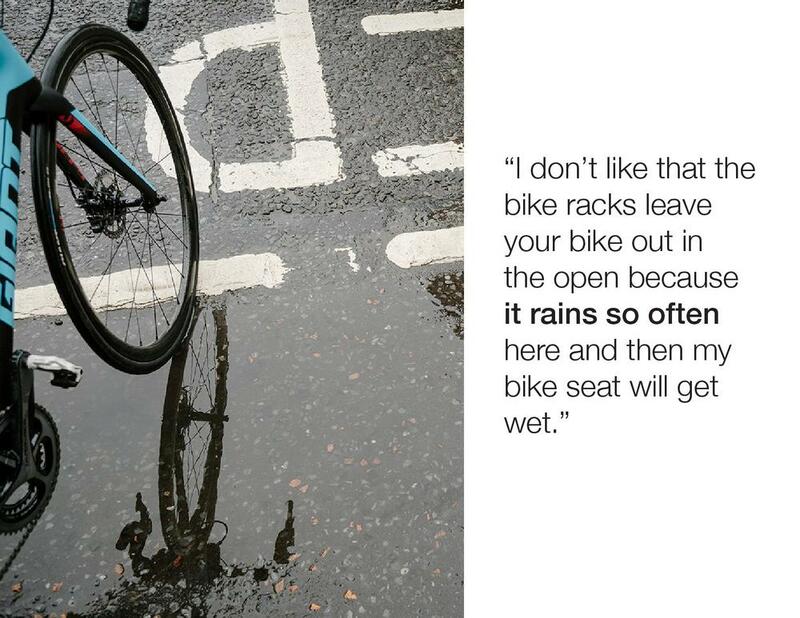 In addition to our quantitative data, we summarized our findings into a book of quotes on what the cyclists identified as problems with current CMU bike racks. Our findings helped shape our solution to improve the bike racks. In the future, they would offer protection from Pittsburgh's harsh weather, increase space around each bike to prevent cluster, and increase bike racks considering the number of bike riders on campus. Our last step was to summarize our design research and solution into a poster, as seen on top of this page.